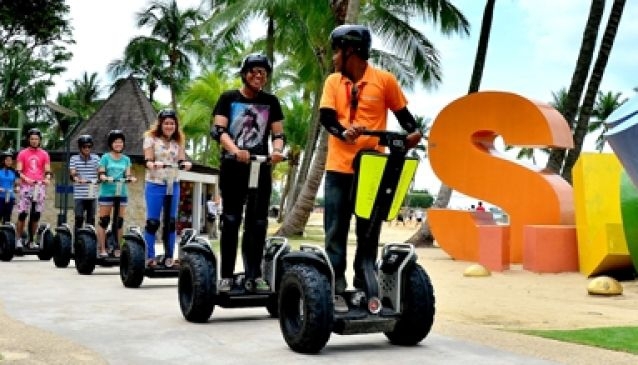 Gogreen Segway Eco Adventure offers several tours to experience all of Sentosa, each perfectly suited for the diverse traveler. From the Segway Fun Ride, the Segway Guided Eco Adventure and even a night tour called Gogreen After Dark, which happens to be Sinapore's first and only Segway Night Tour! The Gogreen tours provide each gust with a unique Sentosa experience with endless opportunities for fun. View nature, feel the breeze along the beach, join in the fun and see Sentosa from a different perspective, all while being gentle to the environment. Please note the minimum height of 105 cm and that children below the age of 10 will be accompanied by a walking guide.